The Agilent HPLC 1200 provides a modular solution allowing users to customize to meet their Chromatography needs. This HPLC system is built to boost product development and provide robust analysis, with superior resolution, speed and a heightened sensitivity. The 1200 series HPLC system components can either be used individually through a controlling PC or a as plug and play stack that automatically handshakes with each other. This Agilent HPLC 1200 consists of a G1322A Degasser, G1311A Quat Pump, G1365 MWD Detector, G1316A Thermostated Column Compartment, G1329A ALS Autosampler and G1330B FC/ALS Thermostat. This HPLC multi wavelength diode detector allows for flexible slit settings for a range of 1 to 16 nm, and covers a range from 190-950 nm letting you customize the desired sensitivity, linearity and spectral resolution. The vacuum degasser gives you a stable flow rate solution, that monitors pressure and adjusts the pump on and off as solvents pass through the membranes to remove gasses almost entirely. 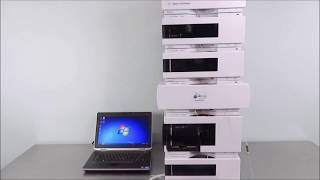 This HPLC System also comes with a controlling PC installed with Chemstation software to help manage and interpret large amounts of data collected from the system. The Chemstaion software is windows based, and user friendly and gives you level 5 control of your instrument with built in diagnostics and early warnings for maintenance. This Agilent 1200 HPLC System and all of its components have been fully inspected and are operating without issue. All of our lab equipment comes backed with our standard warranty. Should you have any questions, please don't hesitate to contact us.